Woodhall Spa Firsts travelled to Grimsby’s Augusta Street ground on Saturday for a Lincolnshire ECB Premier League match. The home side batted first and made a promising start, putting on 42 for the opening wicket. Opener Harry Warwick went on to make 51, with Matthew Cliffe contributing 40 as Grimsby were dismissed for 170 off 49.2 overs. For Woodhall, James White (3-52) and Jack Cooke (3-38) were the most successful bowlers. The visitors then had to face some impressive bowling from Usman Aziz, who returned fabulous figures of 5-11 from 14 very economic overs. However, none of the other Grimsby bowlers could provide a similar threat as Woodhall eased their way to the required total, finishing on 172-6 off 43.2 overs, to win by four wickets. Brandan Luarenzi struck a well-crafted unbeaten 50, which included seven fours, and Jack Luffman fell two short of his half century on 48. Woodhall are fourth in the ECB Premier table. 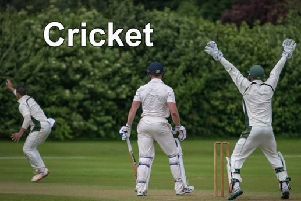 Thomas Dixon dominated the South Lincolnshire and Border League Premier Divison encounter between Woodhall Seconds and Boston Seconds on Saturday. The opening batsman smashed his way to a match-winning 138 not out, crashing the ball to all corners of the Woodhall ground, hitting 19 fours and seven sixes. His opening partner Adam Barker also carried his bat in a steady unbeaten 23 as Woodhall raced to victory by 10 wickets chasing a Boston total of 180-7 off their alloted 45 overs. Earlier Boston had looked set for a much bigger total, having reached 107 before the loss of their second wicket and then 161-3. However, their final total never looked likely to be enough in the face of Dixon’s imperious onslaught, as Woodhall sped to victory in only 15.1 overs.